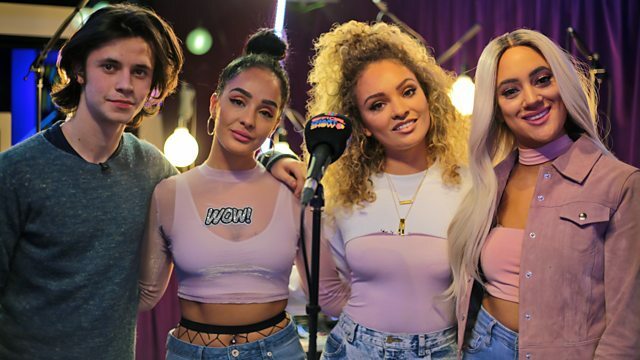 Girl group M.O present their new single, Ray BLK shows off her artistic skills, Naughty Boy performs with Kyla and Greg James joins Cel to reveal the UK's Official No 1. Browse content similar to Girl Power Special with M.O. Check below for episodes and series from the same categories and more! Nice little welcome - welcome, you guys, to the CBBC Chart Show. and kick off your weekend. Today is approximately 8,025 hours until Christmas Day. I've got so many treats coming your way. are either going to be female solo artists or female groups. Well, with her honorary girl for the day, Naughty Boy. And now let me introduce today's special guests. They love lemon cucumber water as well as pizza. They love doing a bit of karaoke in the car. I am, of course, talking about the one, the only, M.O! -Welcome back on the show. we were on the road before. Are you all well? We are. We're excited to be here. OK. Now, a little birdie told me you've had new year's resolutions. Question is, have you kept to them? -Well, getting there. Plenty of time. and I've just not had the time yet. Do you know what language you're going for? I would love to learn Spanish. Hola! I think that goes without saying! I've eaten more pizza than I ever have. if you do want to get involved. Now, your new single, Not In Love. Oh, we ain't got time for boys, have we? -We're all about the girl power. -All about the girl power! but would you like to give us a little performance? performing their new single Not In Love, it is M.O. That is how you kick off the CBBC Official Chart Show. Here they are, M.O with Not In Love! -What a way to start things off. so what I want to know is, who are your female musical inspirations? I think it goes without saying, for me and Fran, it's Queen B.
Singers-wise, I'm obsessed with Lauryn Hill. But as a group, we absolutely love TLC. choose the tracks that get played throughout the show. -Nothing but girls. Should we find out who they've chosen? What a way to start things off. It is Little Mix with Shout Out To My Ex. Always great to have a bit of Little Mix on the show. a little later on in the show. What will you have chosen out of that Girl Power playlist? We will find out, don't worry about that. you're trying to think of clever answers. on a selfie stick that doesn't behave itself. had to do. Here is her Selfie Portrait. Hi, I'm Ray BLK, and I'm about to do my Selfie Portrait. were Amy Winehouse and Lauryn Hill, D'Angelo. a lot more hip-hop, I think, like, Jay Z when I was really young. but the chilling-out part is when I go to the sauna. and just read a book, or something. Er, Building, Living, Knowing, as it is! That's the best I could give you. I couldn't think of anything for Y.
and it's not really working. I make a really good spag bol. like, with real tomatoes, and I, like, slow-cook it for hours. Probably with my best friend. She says the dumbest stuff ever, like, the dumbest stuff ever. but it was, like, such a stupid dance. It was such a stupid dance, it made me laugh so much. I think it's pretty accurate. Hi, I'm Ray BLK, and this is my Selfie Portrait. from Ray BLK, I must say! Self-portrait skills second to none. from our guests. It is M.O in Ask Me Anything. CHEERING There we go. Thank you! Tell you what, studio audience a little bit low on form. Sort it out! Let's hear it for today's studio guests, M.O! Calm it down - that's enough. -Are you ready to answer the questions from your fans? Here we go. I'm getting on with it, don't worry, Mr Director. What is your favourite vocal warm-up? I don't really like warm-up! -We like this one, don't we? -But you can only do it if you hold your mouth like that. Niamh would like to know, how did you get together? -Here we are! The rest is history! We're so glad you did. OK, let me see what we've got here now. OK. Yes. Kwanu would like to know, what were you like at school? I was like an angel with the devil horns. and...I knew who I was, let's just say that. Let's hear it for the honesty, everybody. Thank you for your questions. Now, you're sticking around, aren't you? -Not going anywhere. That was Ask Me Anything! Sometimes that host is a little bit much. and we kicked things off, as chosen by you, with Little Mix. You had ten female artists to choose from, three votes. Zara Larsson with Lush Life! your second Girl Power playlist track choice. and Hacker T. Dog has even given it a go. It can only be one thing I'm talking about. That is Note. let me hear it, make some noise for M.O! OK, bring it in, bring it in, bring it in. Take your positions just there in the arena. Whoa, whoa! OK. Clear the mic, clear the mic, thank you. Ladies, how are we feeling? We're ready to knock the top people off the spot. I'm a bit nervous, though, not going to lie. Do you want to see who's at the top? Have a little gander at this. -Don't worry about these at the bottom. We've reached the top ten, we're talking 30s and above. I would have thought Jonas Blue would be at the top. -There you go - WSTRN with 45 seconds. Let's show them what girl power is! and the winner goes on the leaderboard. -Shall we see who you're taking on? Obviously it's all girls today on the Wheel of Note. Here we go. Who will it be? Could be Radio 1's Clara Amfo. Could be Honey G.
-We've got Kyla! Chart Show friend. -Here we go. Should we see how she got on? It's a bit of a bold note. Came from nowhere. There's a quivering, we're quivering. You've got this, you've got this. Do you want me to count you in, yeah? Here we go, M.O taking on Note. We're still going, we're still going. You're getting on that leaderboard! Let's see you run a lap of honour around the studio! M.O on the leaderboard, and we've got more M.O next week. and I also enjoyed the hand on the diaphragm. Kind of a unanimous thing. So, we've had Little Mix, we've had Zara Larsson. It's only a bit of the Swifty with Shake It Off. -# Who run the world? # Won't you come on over, baby? Wonderful, wonderful choices there, guys. from our Girl Power playlist this week. -Look at us with our blue jumpers! It's almost like we, kind of, choreographed this to happen. that you do wrap up for the weather. -But not as important as the Official Chart top ten. -Thank you very much, Greg. Shall we get into it? Both Anne-Marie and Clean Bandit nominated for Brit Awards. Sean Paul, not so much. But Rockabye, Clean Bandit, down four places at nine. It's a non-mover for JP Cooper with September Song. They kick off their European tour in just under a month. -would you like to go with me on the 24th February? Excellent. Chainsmokers and Paris is at seven. Up one place this week for Call On Me, Starley. That was a genuine invite, by the way. -Now you've said it on telly, it has to come true. Human, Rag 'n' Bone Man, is at five. Shout Out To My Ex, but up two places is Touch from Little Mix. This is up one place, Jax Jones featuring Raye, You Don't Know Me. Castle On The Hill from Ed Sheeran is a non-mover. seven million views in 24 hours. Yet again, it's Ed Sheeran versus Ed Sheeran. A third week at number one for Shape Of You. number one and two for the third week in a row. Can anyone stop him? of course, had that massive number one for 15 weeks, One Dance. I can only be talking about Chart Show friend Kyla. cos it's all about the girl power. This is Should've Been Me. # How could I let you leave me? Oh, I tell you... Future number one there, possibly. We're going to be finding out where that charted next week. and it went down an absolute storm. Wonderful choices, as always, by you. Next week, it is going to be all about our friends across the pond. It is going to be the US A-list Playlist. We having that one? We having it? so nothing but songs from our wonderful cousins in America. # I said, "You're holding back"
bbc.co.uk/cbbc if you want to get involved. and also put your questions to next week's guest, Sophia Grace. -Thanks so much for having us. No, no, the pleasure is always all ours. What have you got coming up? we got loads of exciting festivals. -just follow us on our Instagram and our Twitter, @MOmusic. Well, again, you are welcome back any time. -please sign our Chart Show box. you beautiful people, I'll see you next week. Goodbye. It's girl power week, and Cel reveals which Pop Princess Picks listeners have chosen for the playlist. Girl group M.O join Cel to perform their brand new single, BBC Sound of 2017 Queen Ray BLK shows off her artistic skills in Selfie Portrait and one Naughty Boy even sneaks in to perform with Kyla. Plus Radio 1's Greg James joins Cel to reveal the UK's Official No 1.